As Ally Shewan strolls for his morning paper in Peterhead, braced against the lethal wintry conditions, it cannot help but remind him of times of old. 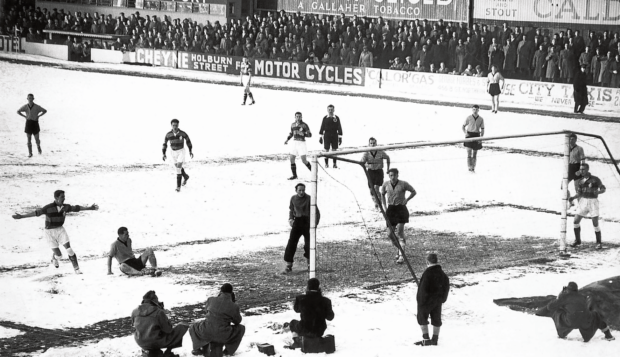 He was part of the times of yore when football existed in sepia-toned photographs and would be played on pitches carpeted in snow – when a slide-tackle was as crisp and aggressive as the blizzards currently battering Scotland. Aberdeen legend Shewan, who between 1963 and 1969 made a record 313 consecutive appearances for the Dons, looks back on those days fondly, with memories of pitches becoming muddy quagmires for his afternoon’s work as the supporters crammed shoulder-to-shoulder for a glimpse of the heroes of the day. Shewan said: “I was looking back through some of my old scrapbooks the other day and we played games in pure mud. “That was back in the 1960s when we had real players. You would be expected to play in a couple of inches of snow where they’d just clear the lines. “It happened at Pittodrie a couple of times. As long as the games were on, the crowds would still turn up. “Sliding tackles were great fun in weather like that – and you got away with it. Back then sliding tackles seemed to be more about getting the ball but nowadays they get the man more often than not. “The referees were a lot better. Tiny Wharton was a great referee. He didn’t stand and call you over. He would run up beside you and say ‘now now Mr Shewan, no more of that’. You knew you couldn’t get away with it. Duels with Celtic often spring to mind. The all-conquering Parkhead side of the late 1960s featuring Lisbon Lions such as Billy McNeill, Jimmy Johnstone and John Hughes would prove the sternest opposition. Alongside Shewan stood long-serving goalkeeper Bobby Clark, Tommy McMillan and Jens Petersen as the 1967 incarnation of the Dons went toe-to-toe with the Celts for the Scottish Cup. Turnbull was their commander-in-chief, who did finally beat Celtic in a cup final three years later, with future Manchester United captain Martin Buchan in his ranks. Shewan, now 77, is a product of a bygone age, where games, regardless of the weather, were ones to be relished. His 50-year association with the Dons ended in 2016 after he stepped down as a matchday ambassador but his legacy remains in the form of the AFC Former Players’ Association. He still goes to Pittodrie, where his Iron Man reputation, earned during a post-season tour to the United States in 1967, alludes to his fearlessness as one of the era’s great Scottish defenders. Shewan said: “We had a game against Celtic at Parkhead that was really icy. Celtic attacker John Hughes was running about in baseball boots while we were in football boots. “He had no problems because he was getting a better grip. We were going in for sliding tackles and I came off with both of my hips bruised. “The game shouldn’t have been played and unfortunately we were on the wrong end of the scoreline. I remember one reserve game in which Eddie decided to play the first team against Celtic reserves because we’d not had a game for two or three weeks because of the weather. “There was a lot of snow that day and I remember looking over to see who their number seven was.